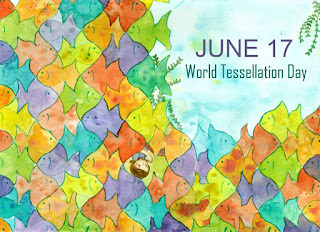 Exciting new development: Emily Grosvenor, author of a new children's book on tiling called Tessalation, is starting World Tessellation Day, June 17th Escher's birthday. I have an old fashioned webpage with these tessellation resources, and I've decided that I'm still using them enough that I should keep them up to date - which means moving them over to the blog. If I was being really retro, I'd try to find one of those old-timey "Under Construction" gifs. I like teaching tessellations at all levels of math, and have done so from 2nd grade up through graduate level math classes. Quasiperiodic tilings (aka Penrose tilings) were even a part of my thesis. While my interests are now more in math education, tilings still hold a deep fascination for me. For younger students it is a deep application of all four Euclidean motions, and for older students the richness provides many opportunities for analysis, problem solving and pattern creation/detection. The following resources are all ones that I have found useful in one way or another. Please don't hesitate to contact me with questions, suggested resources or any mistakes or bad links. I have a few tessellation posts on this blog and more tessellations on the tumblr. My favorite GeoGebra tessellations I've made: Pythagorean tiling, Escherized Hexagon tiling, and Rotation of base kite tiles. (More below in GeoGebra/Blogs section.) I have a separate Google doc of Islamic Tiling resources, a handout I give students when doing tile alterations a la Escher, and a memoir of making a tessellation. Suzanne Alejandre's guide so good! Oriental Rugs, quite a nice unit with student work. Don Steward: Designing Tessellations. Neat approach using grid paper instead of tracing a tile. ArtLex includes some advanced examples. Glide Reflections , an Illuminations activity from the NCTM. Classification of Patterns , a neat grade 7-10 activity on the 17 wallpaper groups. David S. Chow , not the most strongly intreractive, but a large collection with some variety. Regolo Bizzi: handmade tessellations in Escher style, geometric, Islamic patterns and more. Islamic and Islamic Design and another! Prof.s Bart and Clair from St. Louis University have a great Math of Escher site. Cut the Knot's proof of an Escher Theorem about a class of hexagons that tessellate. Wallpaper Groups , a college math major level unit for teaching about the wallpaper groups. Includes Mathematica and Cabri files. Tessellations for Wallpaper Groups and the math by David Joyce, really a master of visual display of high level mathematics. David Austin's two Penrose columns: ribbons and structure. Even better, his applet! In reverse chronological order, mostly. This GeoGebraBook of tessellations collects many of these. jchinn1 has a number of Escher tessellations to analyze. Maybe start with the pegasi. Daniel Mentrard's tessellation and frieze collections. He is a GeoGebra wizard. 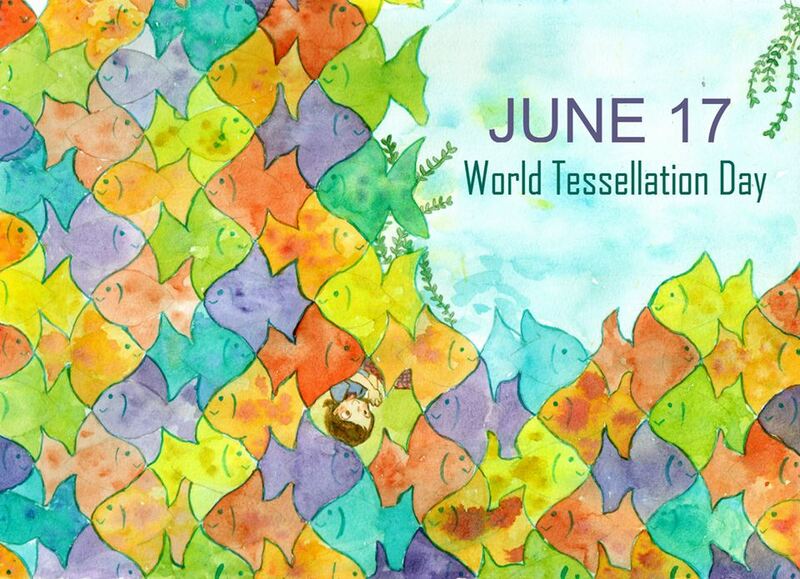 Illuminations' Tessellation Creator is good for investigating regular and semiregular tilings. The (sadly, closed) Geometry Center from U.Minnesota. Still some great applets, like Kali or the QuasiTiler. A translation tiler from Shodor. Hyperbolic Tessellation applet from Don Hatch, and David Joyce has the similar Poincaré.